The Latin term memento mori has long served as a reminder of mortality. Literally meaning, "Remember you will die," the term has traditionally been linked with striking images and stories of dying. Exceptionally clear examples of this tradition can be seen in New England graveyards, where tombstones from the late seventeenth and eighteenth centuries often contain two phrases: " Memento mori " and " Hora fugit, " which means, "The hour flees." These lines explain the accompanying images of hourglasses, skulls, bones, and winged death's heads. The gravestones thus ask passersby to remember not only the deceased but their own mortality as well. 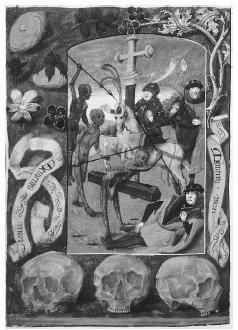 The memento mori reached extravagant heights in Europe between 1300 and 1600 with four new motifs. First, the Dance of Death featured skeletal figures leading people of every rank—from pope to plowman—into a final dance. The historian Jean Delumeau discovers the dance's moral in a fourteenth-century manuscript of the Catalan poem, Dansa de la Mort :"Toward death we hasten, / Let us sin no more, sin no more" (Delumeau 1990, p. 74). Second, in the Triumph of Death, an armed death figure drives a chariot drawn by oxen. As the French social historian Philippe Ariès comments, this image of "collective" death recalls both the processions honoring a prince's arrival and royal funeral processions. Third, the era's most individualized and grittily realistic memento mori motif occurs in double-decker tombs. The top carvings portray the deceased lying dressed in full regalia; but the carvings beneath present the deceased as exposed transi, or decaying corpses. Finally, in the legend of the Three Living and the Three Dead, three well-dressed men are out hunting, and as they approach a cemetery three dead men attack them. This image accompanies the prayers for dead in a Book of Hours, a prayer book from the late fifteenth century. The margins reinforce the image's point with skulls and scrolls reading "Memento mori." The prevalence of these motifs has been explained in several ways. Beginning in 1347 the Black Death decimated Europe. Coupled with wars and failing crops, disaster of this scale reshaped society. As Delumeau and Ariès have shown, these empirical forces reacted with a culture of guilt and emerging individualism. Both perspectives found a compelling message in the memento mori motifs. As sermons constantly proclaimed, life is short, status and wealth will not last, so prepare to die. Only the prepared will avoid hell and enjoy heavenly life. In all its forms, the memento mori thus incited people to learn the Ars moriendi, or "art of dying well," which required one to live righteously in preparation for death. New England tombstones undoubtedly continued this message. In Guyot Marchant's 1485 version of the story, The Three Living and the Three Dead, the living survive the encounter, pray before a cross, and resolve to change their lives . decay led historians like Emile Mâle and Alberto Tenenti to contrast these motifs with Christian belief. And as both Delumeau and the art historian Paul Binski note, being reminded of one's mortality can lead in directions that preachers would not approve: Because life is short, one should enjoy its pleasures while they last. These ambiguities also permit the tradition's images of skulls, bones, and decaying flesh to be used and manipulated in popular culture. They can fuel horror films and give an ironic edge to rock bands. Yet the tradition also retains possibilities for more probing, reflective efforts like the "Memento Mori" episode of television's X-Files, where Agent Scully confronts her diagnosis of a brain tumor. Remembering one's death can still exert a transforming power. Binski, Paul. Medieval Death: Ritual and Representation. Ithaca, NY: Cornell University Press, 1996. Delumeau, Jean. Sin and Fear: The Emergence of a Western Guilt Culture, 13th–18th Centuries, translated by Eric Nicholson. New York: St. Martin's Press, 1990. Ludwig, Allan I. Graven Images: New England Stonecarving and Its Symbols, 1650–1815. Middletown, CT: Wesleyan University Press, 1996.